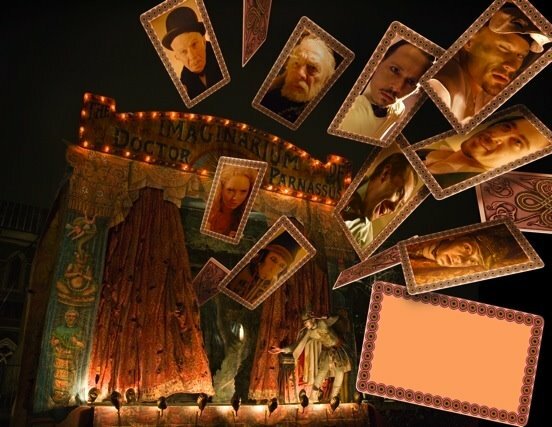 The clip below of Terry Gilliam’s movie shows Heath Ledger as Tony, who’s part of a troupe of performers trying to save Dr. Parnassus’s daughter from the Devil. Parnassus (Christopher Plummer) had promised his daughter to the Big D in exchange for immortality and now wants to renege. As you well know, Johnny Depp, Jude Law and Colin Farrell stepped in to play different versions of Tony after Ledger’s death (all four actors are in the above picture). Q: Besides I’m Not There, name another movie in which more than 2 actors played the same character. I’ll take entries until Tuesday, July 28, noon PT. Put your nerd cap on! I remember I answered this question a few months ago in a previous comment and I named “I’m not there”! I thought of Todd Solondz’s amazing “Palindromes”, where Aviva’s character (whose name is a palindrome) is played by 8 different people: a little boy, a little girl, four young girls and two grown-ups actresses, Sharon Wilkins and Jennifer Jason-Leigh! Julien, you are GOOD! Applause is definitely in order. Yes, I had to eliminate I’m Not There because of your previous answer. Didn’t want to make it too easy for you and any other readers who may have seen your comment. But you’ve impressed me again with your film knowledge. Well done! Thanks for the applause, PCN! And I’m clapping my hands for Leopard13 too! Wow, he gets 3 entries for 3 answers! In “The curious case of Benjamin Button”, Benjamin Button is played by Chandler Canterbury, Spencer Daniels, Charles Henry Wyson, Peter Donald Badalamenti and Brad Pitt of course, while Daisy’s part is played by Madisen Beaty, Elle Fanning and Cate Blanchett. Here are a few more that I dug out of either my mind or my friends’minds! * In Ron Howard’s “Da Vinci Code”, Audrey’s Tautou character is also played by 3 other actresses for the childhood parts. * In Bertolucci’s “The last emperor”, the heroe Pu-Yi is played by 4 different actors. * In “The Matrix reloaded”, 5 actors (including Keanu Reeves) play Neo at different ages. * In “Eulogy” (2004), Zooey Deschanel’s character is played by 2 other actresses and Jesse Bradford’s one by 3. * Rober Wagner, Rob Lowe and Evan Farmer all play Number Two in “Austin Power in Goldmember”. * In James Bond satire “Casino Royale” (1967), David Niven, Peter Sellers, Woody Allen, Ursula Andress and a few other actors share the part for James Bond 007! Wow! I couldn’t remember about Austin Power in Goldmember… and as a matter of fact, there are also 3 actors who play both Austin & Dr. Evil (Mike Myers, the ‘kids in Spy School’ and the babies), not counting Tom Cruise and Kevin Spacey. And Julien, to write things in italic you just have to put an “i” inside some at the beginning of the phrase and a “/i” at the end. The same works with “b” and “/b” for bold. Damn, I cannot put them (the forum deletes them). They’re the triangle thingies that work/look like a parentheses. Thanks for your help Poncho! Sorry PCN, I’m polluting the comments in vain, oops! No worries, Julien. You almost got it. Instead of brackets, you just need to use the “less than” and “greater than” symbols around the i and /i. These symbols can be found on the comma and period keys of your keyboard in the caps position. James Cameron’s Titanic: Kate Winslet and Gloria Stuart play the same character at different points in time. Atonement: Saoirse Ronan, Romola Garai, and Vanessa Redgrave play the same character at different ages. What Dreams May Come: Jessica Brooks Grant and Josh Paddock play the Nielsen children on Earth, while Cuba Gooding Jr. and Rosalind Chao play them in Heaven. Superman (1978): Christopher Reeve, Jeff East, Lee Quigley and Aaron Smolinski all play you-know-who. Wow, you’re good, too! Without research, I also came up with Atonement & Superman. Haven’t seen What Dreams May Come but I’m afraid Titanic doesn’t fit because the question stated I’m looking for roles played by more than two actors. You definitely qualify for the random drawing, though. I’ll give you 3 entries since you came up with 3 good answers. Dang! All had was Superman and Atonement…. Okay, back to researching the archives…. I don’t know if this one counts but in Harry Potter and the Philosopher’s Stone, Harry was played by Daniel Radcilffe and by the Saunders Triplets (3 babies!). And by the way, Voldie’s been played by at least 5 different actors along the saga. Technically, in both X-Men and X2, Mystique is sort of played by a lot of actors, not just Rebecca Romijn, just because she “morphs” into lots of them. In Matilda, the title character is played by Mara Wilson, Sara Magdalin, Alissa and Amanda Graham, Trevor and James Gallagher, Kayla and Kelsey Fredericks and Amanda and Caitlin Fein. Ed Bloom is played by Ewan McGregor, Albert Finney, Perry Walston and some baby in Big Fish. In The Lord of the Rings: The Fellowship of the Ring, Brent McIntyre and Shane Rangi play the Witch-king of Angmar, while Andy Serkis voices him. Not to count the numerous stand-ins that all the characters have in order to accomplish the “heights” issues. In 300, Leonidas is played by Gerard Butler, Eli Snyder and Tyler Neitzel. Of course! You cannot forget the Oscar-bonanza that Hook has for Wendy: Dame Maggie Smith and Gwyneth Paltrow (crap! They’re two) …. Also Peter is played by Ryan Francis, Max Hoffman, some baby and Robin Williams (and another guy in a play). And it would take a while, but several actors played “God” in the series Joan of Arcadia, sometimes more than 2 per episode. I’m blown away. I had a few answers in my head but the scope of your knowledge is mighty impressive. Poncho, love how you got creative by throwing triplet babies into the mix and Andy Serkis doing voicework. Please check your e-mails; I’ve sent the script. Thanks for playing! Thank you so much for the script, PCN! And thank you for organizing this little game, playing with movies is fun and challenging! Thank you so much, PCN. You are the best! I’m starting to read it! It seems great!!!! WOOOO!!! Wow, I am humbled to witness everyone’s movie knowledge. I see I still have much to learn to be considered a true nerd. Rock on PCN! Keep the reviews and contests coming. One day soon I’ll have some rare tidbit to contribute. Ybnorml, it takes years to cultivate true nerdvana but I sense much promise in you (your username was the first clue). Please feel free to contribute any tidbits, rare or otherwise.